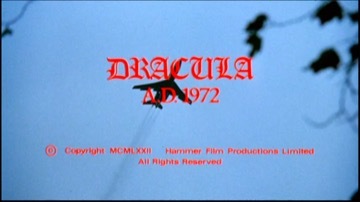 In London in 1872, Count Dracula is destroyed by his arch enemy Van Helsing. The action then moves forward a hundred years to swinging Chelsea, where a bunch of really cool, but very bored, cats hang round a coffee bar. To liven things up, one of their number, Johnny Alucard, who just happens to be a disciple of the Devil, suggests holding a Black Mass in a local de-sanctified church. During the service, as planned by Alucard, Dracula is resurrected and immediately sinks his fangs into Laura, one of the girls. His main objective, though, is to have his revenge on the Van Helsing family, one of whom, Jessica, is a member of the gang of pretty young things….. Exactly why Hammer got involved in this fiasco can easily be explained by the fact that Warner Brothers were actually very keen to finance an updated version of the Dracula myth. What they got, though, was a film which was dated even before its release, but which is worth seeing because it is now funnier than any of the comedies produced by Hammer! On a more serious note, it does seem that the Company was by this time on the slippery slope, desperately looking for something to restore them to their winning ways. Despite everything, however, it should be added that Messrs. Cushing and Lee manage to deliver performances well up to their usual high standard, although Christopher Lee does seem to have a slightly bemused expression throughout! Stephanie Beacham starred again with Peter Cushing in Amicus’s “..,and now the Screaming Starts” (1973). Caroline Munro had come to Hammer’s attention thanks to the Lambs Navy Rum adverts in which she had appeared (one of the posters can in fact be seen plastered to the side of the bus garage in “On the Buses”). She also appeared in Hammer’s “Captain Kronos Vampire Hunter” (also 1972). In the 1950s, producer Josephine Douglas presented, along with Pete Murray, BBC TV’s legendary pop music show “Six-Five Special”. Incidentally, the trick of reversing ‘Dracula’ to produce the name ‘Alucard’ was not a new one and the idea had been used by Universal Pictures in their “Son of Dracula” (1943, with Lon Chaney, Jnr).